The nearest train station from Sophia Antipolis is Antibes. More information about routes, timetables, prices, and reservation can be found here or here or here. The international airport of Nice Côte d’Azur is 20km away from Sophia Antipolis. More information about the airport and flights can be found here. Once you arrive by plane at Nice airport, you have a choice of transportation options to reach your final destination. See bellow. Also, the Nice airport website contains a lot of informations. Taxi costs about 55€ and the trip is around 20min. Bus 230 “Sophia Express” outside the airport terminals (see map bellow) brings you directly in front of INRIA in Sophia Antipolis in 30 min for 1.50€. Timetables can be found here (pdf). Bus driver should tell you where to go. You have several options depending on your arrival time. You will find all information on Nice airport website. Bus 200 “Aéroport – Cannes RN7” will bring you to Antibes or Juan-les-Pins for 1.50€. Timetable can be found here. Bus 250 “Vallauris Express” will bring you to Antibes for 11€. This way more confortable and faster than bus 200… Timetable can be found here. 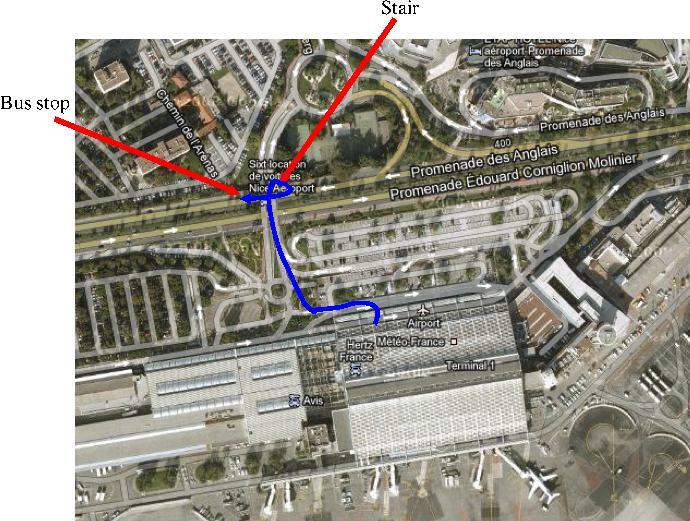 Train: the train station “Nice Saint-Augustin” is 1km away from Terminal 1. You can either walk or take Bus 23 from Terminal 1. Maps and usefull informations can be found here. Then you can take a train to Antibes or Juan-les-Pins, depending on your hotel location. Timetable can be found on ter-sncf or sncf servers or on the more efficient Deutsche Bahn server….